Almost all the YouTubers or vloggers think the same way & I believe it right that getting viral video will make you famous, make you rich, and even more make you completely happy. Getting your video viral on social sites is like 'a box office hit for a director'. Once you get a viral video, you can reach millions of viewers all around the world, get more publicity, more authority, & ultimately more revenue. For any YouTube channel, having a viral video is like a blessing to stand in a crowd, no matter who is publishing the video, no matter from which region you belongs to, no matter which language you used to speak. Once your video goes viral, not only you able to get thousands of subscribers free per day but also your channel will able to drive the attention of advertising agencies for your more monetization options. I'm sure if you able to find a perfect strategy for making a viral video, you would be able to achieve merit excellence in publishing viral videos. Thanks to Google analytics, one of the best & free search analytics tool. You can analyze all your videos, you can check all your traffic, you able know from where the viewers are coming from, from which country you able to driving traffic most, even more, what devices they are using to watch your videos, what part they are liking the most, their age, their interest and so on. And after all the research & analysis, here I am going to share most working and effective methods of making your YouTube videos viral online. Also, if you haven’t read Top 15 Best Strategies For Building a Successful YouTube Channel Professionally | Vlogging, I highly recommend checking it out before going any further. I reviewed a lot of things with the most popular and trending videos on YouTube, I got some interesting tips and tricks, which will help you to grow your YouTube channel and video views. 1. Keywords researching is important. First of all, you have to research most trending keywords. You must know which type of keyword you can use while publishing the videos on your YouTube channel. Targetted Keywords are depended upon what kind of topic you choose for the video. Particularly if you are publishing any business-related video then you have to do a broad study not only on the topic but also on the most popular but related videos. For better understandings, you can read the most trending page on PBB, talking about the importance of keywords in SEO. There is no possibility for any video to go viral without researching keywords/tags because keywords are the most important factor in getting higher search rankings for your video. By using the targetted keywords/tags the search engine will able to know about your video, its content and it makes your videos to reach top positions in the search results. 2. Promoting on social media. Before you going to publish your video you must prepare for promoting it in all the social networking sites like Facebook, Twitter, WhatsApp, Instagram, and even more with your friends & groups as well. The social media sites will not only help you increase the reach of your videos but also improves the user engagement, more followers with your targetted traffic. Publishing the video is one part, but you need to set a goal like to drive 10K video-views on the first day, 50K views in a week, and then 1 million video-views in a month. In this way, you can able to see your video on the trending page of the YouTube. 3. Producing quality video content. If you want to be famous and make your video viral on the internet, it is most important that you have to publish quality video content & it must be satisfying. If the video is not good enough then it will be ignored by the users and will negatively impact your channel. Your viewers and subscriber will not like & share your video if you failed to publish quality video content. And on the other side, if you used to post most helpful, useful and engaging videos, you don't require to request your users to like and share. People will do share and like your videos more and more. Quality content not only drives more attention but more subscribers and help you trend on YouTube. 4. Telling your brand story with video. A story is the most important aspect of the video. If there is no story in the video viewer will get bored easily and then switch to the next video. So the subject of the story is the most important thing for every uploading video on the internet to go viral. Usually people eager to know the stories through your video message in order to make an opinion about the world, it helps them to bring purpose to their daily life routine. Your story may help them to understand and build trust. And that's exactly why stories are the most powerful way to reach the audience. For a great story, you need to be more attractive, different, unique and engaging. The story makes your video goes viral fast even you are talking about negative character. You can pick some subjects like inspiring, motivational, indetailed reviews for making your video engaging. You can choose the topic of something out-of-the-box & write it catchy so the people would love it and share with their friends. Making an appealing story is so important; your viewers, subscribers, and followers always want to know about your video stories. Dialogue is the main part of a video. If there is no dialogue in the video users will get boar to see your video fully. Effective dialogue writing comes with the practice. Though, the most compelling dialogues are the dialogues comes naturally. The dialogues must relate to your story. The dialogue will create an impression on the people who watch your video seriously. So do not forget to add effective dialogues in the video. Make sure the dialogues you use must push the story forward. If you added 5 catchy and trending dialogues in the video & suppose at least one dialogue goes hit that people love to use it, then that single dialogue can viral your video on the internet. 6. Publishing at the right time. After uploading your video, do not press the publish button quickly, in fact, you should wait for the right time. If you upload your video at the wrong time then you might lose some video views. Monday afternoon would be a good time because most of the peoples are active on the internet and able to check the message of your video easily. In India, a large number of users are getting online at the evening time. If you upload your video at the right time, there are more chances to drive more traffic for extra views on your videos and go viral on the internet. Many vloggers advise to publish the videos between 2pm-4pm on Monday, Tuesday, Wednesday, whereas between 12pm-3pm on Thursday & Friday. 7. Making your video shorter. Most of the times, shorter videos go viral on YouTube. Since the viewers don't like to watch videos for a longer time and they do not see full videos till the end, it becomes difficult for the publisher to make longer videos go viral. Shortest video length should be 3 to 5 minutes. Anyhow there is a fast audience on the internet, so it is worthless to upload long length videos. At max, you can make the video having a time period of 5-6 min. People are usually interested to watch short videos and watch till the end. It is better to upload short and fast videos on YouTube. For shorter videos, it is easy to go viral and drive more video views. 8. Writing viral titles & description. The important part of your video is the title, its description, & tags. Make sure these all things must be properly selected & related to your content and the channel. If there is an appealing title, then the maximum number of people will get attracted to watch it. Just before publishing, go to the YouTube website, search the related videos to the topic you are going to publish. Start analyzing most trending and viral videos published by other YouTubers. Check their titles, description, tags, keywords, and thumbnails as well. After that, you can get to know what keywords you need to add, tags, title, and description regarding your video. Viral market research is important, after adding catchy titles and tags, your video views will increase definitely. Also, the video will go viral easily on the internet as well as on the YouTube trending page. So the titles and descriptions are the most important part of winning and making viral videos. Create your videos with talented people only; so the video will convey better act with better logic. Such a video turns out to be magic, and it will impact on people. Only a good dialogue is not important, but the dialogue delivery matters more by a better person who influences your audience. Make a team and do work together, choose the members who already have online identity and better fan following. With the support of them and their followers, it will become easy to viral your video on YouTube and other social networking sites. 10. What to do when a video goes viral. Once after your video goes viral; your subscribers, viewers, will not only appreciate your efforts for making quality video content but also some users will criticize your work. Once you go viral, you will able to get lots of and different types of comments on the video. I can say, it is good at one point since you are driving more people and so more video views. Like positive, you will also get negative comments. You have to be prepared yourself for these kinds of situations. You need to be careful about avoiding any mistakes while making your video. Your one mistake will cause controversy about you and your channel. On the other side, after getting viral your video, the media partners would like to contact you and ask for the interviews; so for this also you have to be ready & get prepared yourself to influence the people. Your singer viral video will make you most active & trending influencer on the social media. One of the effective strategy in video SEO is getting backlinking. For a particular topic, the search engine listings are massively dominated by the number of related video links redirected towards with the description, and tags in the video. But if your video is recommended by any authority website, it will produce a great impact not only on your subscribers but also on search engines to list you on the top. 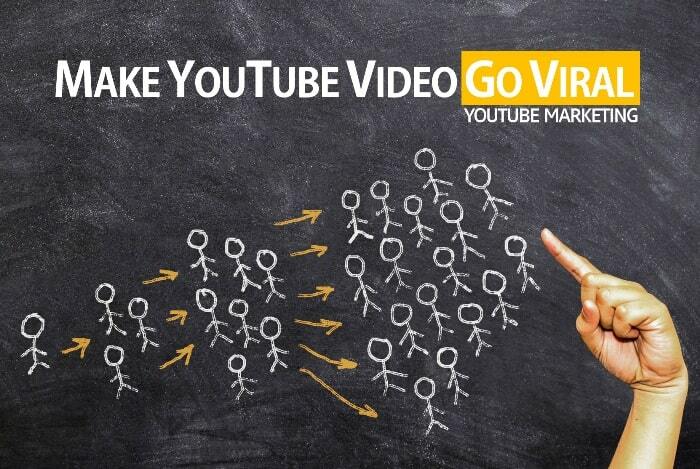 Actually, getting the attention of the influential & authority website can push your video go viral on YouTube. For the latest tricks and tips about YouTube marketing, video SEO, and growing your YouTube channel, you need to subscribe the newsletter from ProBlogBooster.